September 2009: Our newly constructed deck was the setting for a Labor Day dinner with friends. 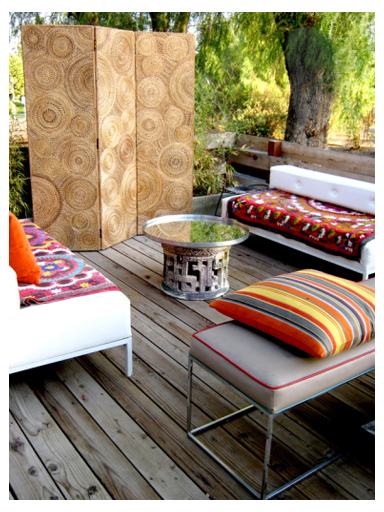 Bamboo filled the concrete troughs at the back end and white vinyl sofas sported colorful suzani covers. Not bad, but that screen’s a view blocker. Of all the pieces shown only the gray vinyl bench in the foreground still lives with us. To read the original post — including menu recipes — click here. April 2010: It’s a little over 6 months since that first small party and we’re having a big birthday bash for our friend, Terry. In honor of the occasion, the deck is, er, decked-out in spectacular fashion. Note the painted wood screen wall on the left in the topmost photo; it’s since been taken down. And, except for the gray vinyl bench and a few odds-n-ends, not much else is still with us. The party was a success; read about it by clicking here. April 2011: Although this photo was taken from a post published in 2012, it was actually shot in 2011 by L. A. Times photog, Irfan Khan, during the Riverside Flower Show & Garden Tour. After 2010’s big party I decided to pare the deck’s dressing down, way down. 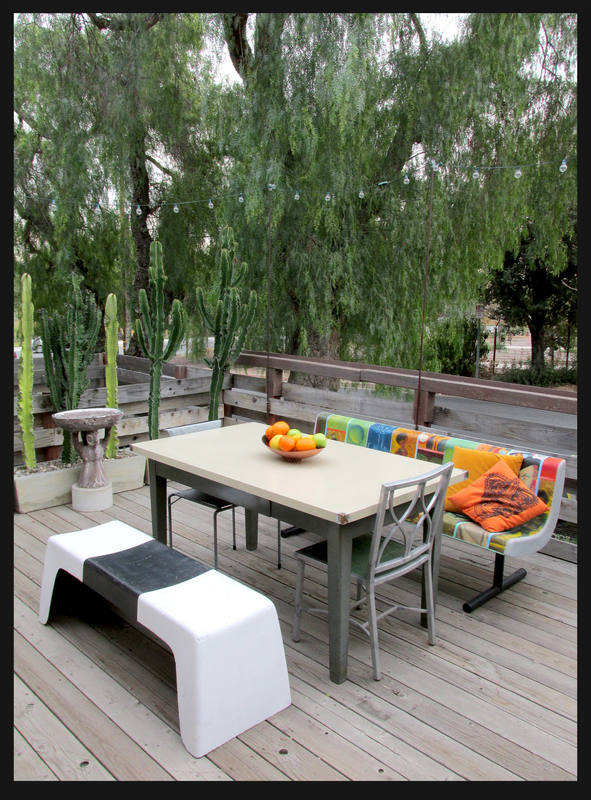 Plus, I nixed the scraggly bamboo, replacing it with small cactuses; deleted all but a very few pots and plants; I permanently painted the white vinyl sofas. By the time I learned that we’d been accepted for the tour a year later, the space was simple and much less frenetic. Click here to see the rest of Khan’s photos, the Rancho has never looked better! 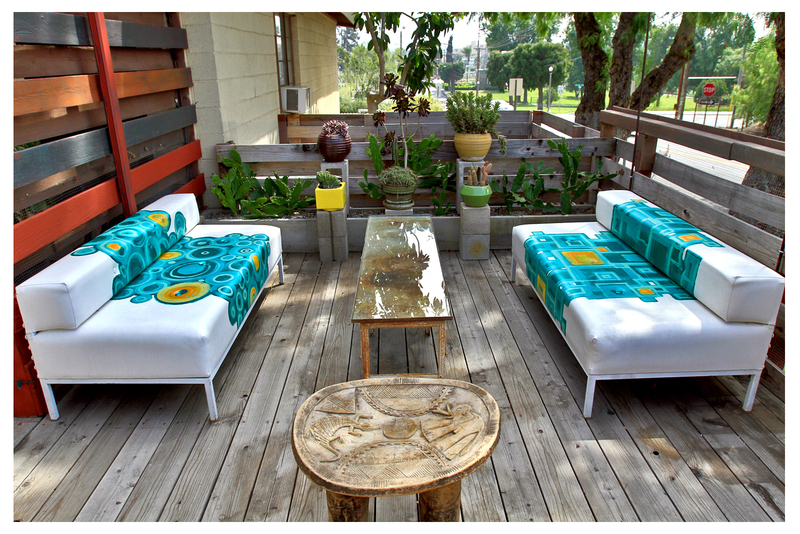 June 2012: The deck area has changed from a party hang-out to a dining spot in a year-and-a-half. The cactuses in the troughs have been replaced by fence post-like euphorbias, while at the other end an assortment of potted plants stand-by. 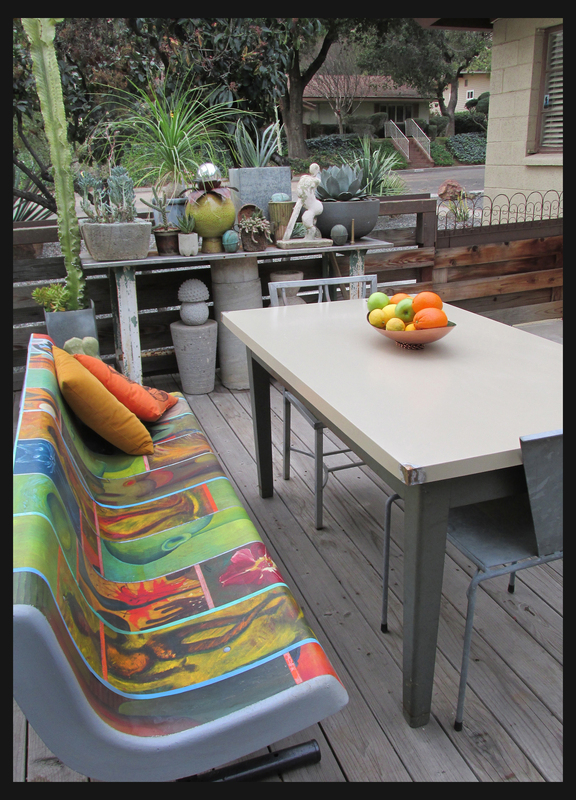 A colorful runner jazzes up a gray workbench/table; metal chairs, stools and the gray vinyl bench offer seating. Of the pieces here, only the metal chairs, the rolling dolly and the potted plants still occupy the space. See more by clicking here. Which version of RR’s deck dressing did I enjoy the most? I think 2010’s iteration was my favorite overall. I distinctly remember the fun of moving all those elements, stacking them, looking at them, then moving them all again, over and over until I was satisfied. I remember how much fun planning the party was and how everyone seemed to enjoy themselves so much. Now, of course, all that moving and stacking has to be done for me by others … and while it’s still satisfying, it’s not quite as much fun as doing it myself. I appreciate my helper’s efforts, don’t get me wrong, but I used to spend hours outside doing it by myself, without worrying about getting it right the first time because the crew’s only going to be around for a short time … Hey, that gives me an idea: I’ll celebrate the deck’s current dressing and my helpers with a small gathering in the space! I’ll post on it, and include recipes, when the time comes. Nice changes. Wish I had your eye. And a place that I loved to work with. Thanks, Vickie … although I owe it all to my dedicated crew of helpers. I literally couldn’t get any of this done without ’em! If only we could get our bodies to cooperate. I can come up with some decent ideas but can’t convince the body to agree to the work. So I’m picking around with a few things. We’ll see….. I love how refined your exuberance is. I think 2010 was my favorite but I’d happily occupy any of them. When are you going to publish a book already? Love, love, love, love them all! I love how the Rancho is always changing and evolving! I tend to create something in my space and then leave it… forever! Probably because my property is so large and there are so many spaces to work with, I find that I just move from one space to the next. I love going to your house, seeing all the changes you do, and that you document with them with photos. Very nice Reuben! OK Reuben…once again you’ve done a great job. What a unique idea to use different shape and size concrete forms. I have to keep changing my rancho because of the sun moving with the seasons, many of my plants need less sun. I wish I had a little bit more space. I can’t remember if I sent photos of my rancho, but I’m kinda limited because the Catio for our kitties takes up a lot of my back area. Again I love and appreciate all of your artistry. I love this look back at this special place. Really interesting to see you at work. You’ve been paring things down, by necessity, I know, but each iteration has its own appeal. That bench with the red piping is killer. I’ve gotta admit 2012 and 2013 are my favorites, but they’re all wonderful in uniquely different ways. Your creativity is protean! I think 2011 was the year I saw it in person. Wish I loved closer so I could be an official RR “helper”! quick amendment! I meant to say 2014 and 2012 are my favorites — your minimalist period! Right, now if only I could fight the impulse to add more, more MORE!